Q. I just purchased a side of beef from a farmer who told me Innovative Foods was the place to get it processed. What do I do now? A. Good question, and one we get a lot. Your beef will come here for USDA inspection prior to harvesting. You will need to fill out a custom cutting form, which tells us specifically how you want your meat. Visit our beef processing page where you can download it as a PDF form, or fill out an on-line, interactive form. You can also call us at 970-330-8400 and we're happy to offer assistance and answer any questions you have. The image should give you a rough idea of where the cuts of meat come from. For a very helpful guide to beef cuts and how to cook them, click here. If you are buying pork, lamb or goat, we have custom cutting forms for them as well: Click here for the pork processing page and here for lamb or here for goat. (For a detailed chart of pork cuts, click here and scroll to the bottom of the page. Please don't hesitate to call if you have questions or prefer to have us take your cutting instructions. Q. How much meat can I expect from my processed beef? A. The meat from the processed animal is called "yield," and it a percentage of the total weight of the live animal. The average dressed beef animal runs about 63% of live weight. Beef heifers generally dress out 2 % lower than steers; dairy beef steers run about 56-61%. Live animal weight 1,200 pounds. 63% dressing percentage = 756 pound carcass. 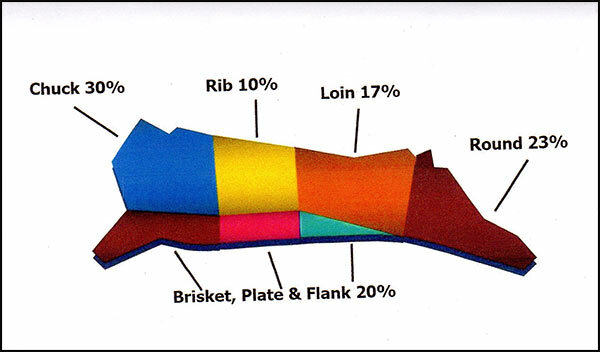 Carcass Yield Grade 3 (average)= 70% yield when obtaining mostly bone-in cuts and 50% yield with all boneless cuts. A 756 pound carcass at 70% = 529 pounds mostly bone-in cuts and ground beef, or 50% if 378 pounds boneless, closely trimmed beef and ground beef. Q. Is it safe to eat meat produced with hormones? A. According to the FDA and USDA's Food Safety and Inspection Service, yes. Growth hormone products have been inspected and tested by these agencies before they come to market. Cattle raised with growth hormones provide leaner and higher quality beef. Bottom line: The FDA and others have concluded that there is essentially no difference between beef from animals raised with growth hormones and those raise without. This information is from the American Association of Meat Processors. Q. I see you no longer offer paper wrap packaging. Why? A. Unfortunately, we are no longer able to get paper wrap supplies from our supplier. However, most of our customers say they prefer to have their meat packaged in a vacuum pack, because the meat will last longer that way, as long as the seal is not broken.